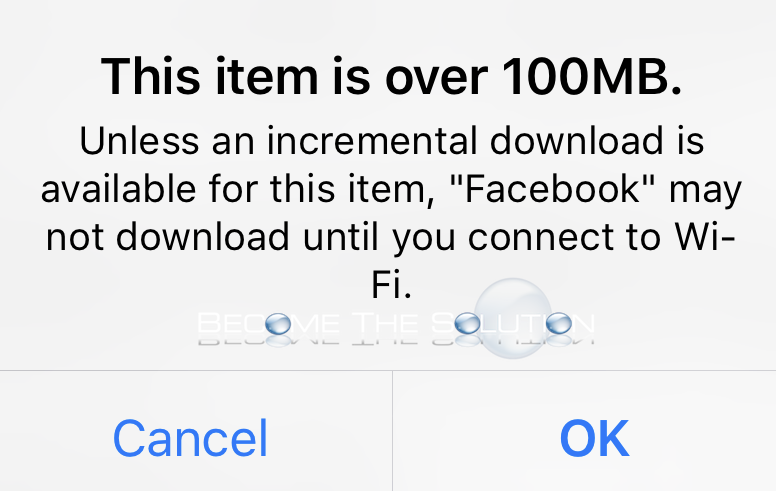 If you try installing or updating an iOS app, you may receive a pop-up message that states the download is over 100 megabytes and may not complete downloading. This item is over 100MB. Unless an incremental download is available for this item, “” may not download until you connect to Wi-Fi. You can now hit OK and the download will complete over cellular. It seems this can not be bypassed if you still choose to download and even if there is no incremental download available. .....also, what is an "incremental download?" Super frustrated that I had a notification via my Apple App Store that there was an update for Facebook, so I updated. Now Facebook will not load on my iPhone 6. I get the "over 100 MB" message and when I hit OK, I get a message that says "Unable to Download App "Facebook" could not be downloaded at this time." SUPER FRUSTRATED!